News flash: It doesn't matter. Yes, I'm dating a boy who goes to a rival school. News flash: It doesn't matter. 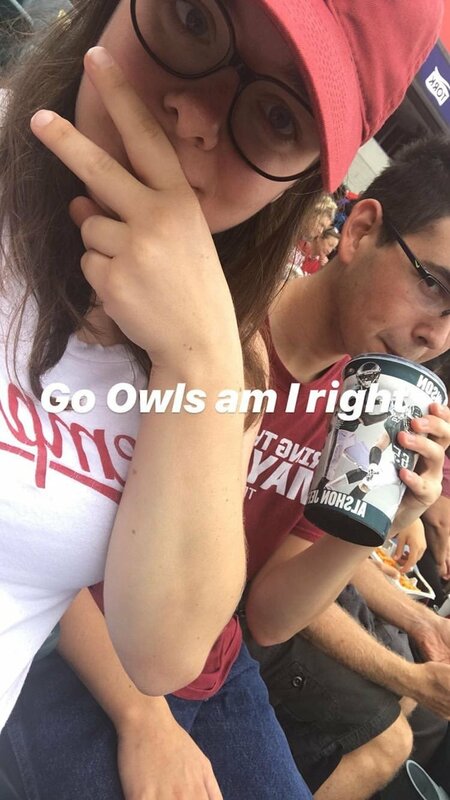 Temple students at every football game love to chant, "F**k Penn State" just because it hypes people up. It's kind of annoying and people always try to stop them, but it's all in good fun because Penn State is considered our rival. Ever since we beat Penn State 27-10 in an unforgettable 2015 football game, that rivalry has been stronger than ever. Despite that rivalry, I don't feel bad for wearing my Penn State shirt around campus. Am I a traitor? No. I love my school, but I want to support his school too. When we first started dating, I refused to use anything affiliated with Penn State. If I made a cup of coffee, I jokingly said, "No, I'll be contaminated" when he offered me his Penn State mug. I'm not that petty, and it was a running joke between us, but after visiting Penn State with him I actually understood his love for the school. We even went to a Temple game together. He rooted for Temple and wore my Temple shirt. That's what people in a relationship do: they support each other, even if the circumstances might pressure them to do otherwise. You can be a die-hard fan for your school, and still root for another school that's considered a rival. You can bet that when Temple and Penn State play again (that won't be for a while), we'll go all out for our schools. We won't speak to each other for days. I'll be decked out in cherry and white and he'll wear his school colors (I think they're blue...it's kind of bad that I don't know). Until then, though, I will proudly support Penn State when he brings me to a game. He'll support my school. It's like the rivalry never existed. Why? Because a stupid rivalry is simply that: a rivalry. Undying school spirit can rest for the sake of love, I promise. Come on, people, get it together. I, personally, think it's time for everybody to just start loving each other. Now listen, this doesn't mean you need to actually love everyone, but at least accept them. Acceptance is the closest thing we are gonna get to loving each other. Let me tell you a little something: politics at the moment are very messy. No matter which side it is, it's messy. There is no denying that. If you try to deny that, then good for you, you're not helping anybody. If you really want some change, you need to start being the bigger person. Change isn't about who can yell about something louder or who has the "better" argument, it's about being respectful. Just because someone has an opposing view does not mean you need to yell at them. Does yelling solve anything ever? Maybe temporarily, like for 2 minutes, but that's about as long as you're gonna get. There's absolutely no need to indirectly say something about certain individuals on social media. Yes, there is freedom of speech, but everybody should keep in mind why they have that right and why they still have it. I do not understand why it is so hard to be respectful of one another. If someone goes after another person talking about how absolutely terrible it is of them thinking something should be illegal, the person who's being yelled at should respectfully ignore the other individual's disrespectful remarks. If the individual does not stop, then they are not aware that they are making no difference in the world. What I'm trying to get at here is that in order to love each other, we really need to accept all our differences. If we really want change we need to go right to the sources, not just yell at each other from across the street. If everyone learned to accept each other, life would be a whole lot easier. Is this ever going to happen? Of course not. This is the solution though, whether you think so or not.